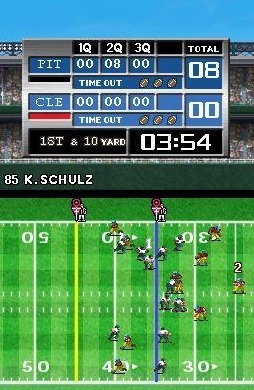 Tecmo's beloved pigskin classic hits the Nintendo DS with snazzy graphics and cool victory animations. Unlike Tecmo Super Bowl for NES, the Nintendo DS revival, Tecmo Bowl: Kickoff features fictional teams, and not any NFL teams or likenesses. You select from 32 pre-made teams, ranging from the Baltimore Bulldozers to the Los Angeles Supercocks (no jokes please), then hit the field and prove your gridiron dominance. This game is strictly about old-school gameplay, so don't look for any fancy touch screen controls. It's all about using the d-pad and buttons to execute plays and see how your strategies hold up against a tough offense or defense. From what we've seen thus far, Tecmo Bowl: Kickoff stays true to the original game, which is exactly what we want. There are a few touches, however, that make the game feel modern. Victory animations look sweet, rather than limited 8-bit maneuvers. You'll see players jump around the end zone to celebrate a touchdown or go for the extra point. In addition, menu screens sport plenty of detail, so you'll have no problem seeing player formations and the path of the ball or receiver. Sound consists of buzzing crowd noises, a brief (but effective) announcer and plenty of hard tackles. Along with Preseason, Season, All-Star and Exhibition modes, Tecmo Bowl: Kickoff also features a multiplayer mode. You can challenge a friend locally through Wi-Fi Connection or hop on the Internet. Best of all, you have the ability to create your own custom team, from the name and location of your squad (let's hear it for the Denver Drunkards) to the uniform colors. You can then take this team online for the world to see. The choice is yours. Heck, there's nothing stopping you from creating your favorite NFL team and players, if you feel up to it. Let's see how Brett Favre feels becoming a Supercock. No matter what you choose, you can't lose with Tecmo Bowl: Kickoff. Tecmo is sticking to the basics, while touching things up to make it a great handheld experience. We'll tackle this game when it arrives September 30 and let you know if it scores a touchdown or fumbles in the end zone.